Looking for the perfect balance of coffee and milk? 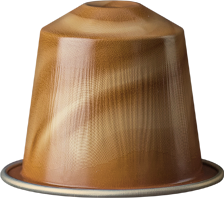 Savour this coffee’s aromatic character through the sweetness of milk or milk froth with BARISTA CREATIONS Scuro. We carefully studied different aspects of the interaction between coffee and milk in order to create this blend, taking our inspiration from Melbourne baristas. They’re the masters of robust, but exquisitely balanced tastes – their roasting and blending lend an aromatic power poised as the yin to the yang of milk. We orchestrated this ideal marriage by giving a meticulous split roast to selected Colombian and Ethiopian arabicas. BARISTA CREATIONS Scuro has the optimum intensity for pushing that roast coffee aroma through without overpowering the sweetness of the milk. Best served as a cappuccino (25 ml of coffee with 60 ml of frothed milk), but it’s also great in a larger Latte Macchiato recipe. Aromatic profile: We took our inspiration from the baristas in Melbourne – they are the masters of robust, but exquisitely balanced tastes – their roasting and blending lend an aromatic power poised as the yin to the yang of milk. Our BARISTA CREATIONS Scuro shows you how intense your coffee can get while still staying beautifully in balance with milk. It’s just roasty enough to push through milk, and its delicate sweetness tempers its intensity to make it a compelling intense cappuccino or Latte Macchiato. Product as sold does not contain any milk ingredients. How many different blends of coffee origins are there? Countless. But not all coffees interact well with milk. So, we couldn’t leave the ideal marriage of coffees and milk to chance. Of all the origins we tried from around the world, we selected some of the finest Colombian and Ethiopian arabicas for BARISTA CREATIONS Scuro. The aromatic potential of these two coffees is punchy and promises a harmonious composition of tastes that land with precise balance when you add milk. The art of roasting calls for a fine balance of temperature, roast time and bean colour. Getting it just right is key to striking that great harmony of coffee with milk. We tested lots of combinations until we discovered that to get that ideal flavour balance in BARISTA CREATIONS Scuro with milk, we needed an contrasted split-roasting technique. One part of the blend gets a long and dark roast, and the other is roasted much faster and lighter. 10 BARISTA Scuro capsules of roast and ground coffee for the Nespresso system.